SKU: #05. Category: Western eBooks. The “Homestead Act of 1862” was the match that lit millions of Americans dreams back east of wanting to own their own land out west. Each married couple was eligible to own 160 acres of land out west if they lived on the land, built a home and farmed it for five years. Marble, Colorado was one such tiny town that held the promise of work in the marble quarry, gold or silver mines. But the lure of striking it rich finding gold wasn’t the only driving force that made families make the perilous journey across the plains to settle in the west. Entrepreneurs saw the taming of the west as an opportunity to make a fortune supplying pioneer families with what they needed to survive. Cheyenne’s Destiny by Raymond Cook is a 235-page story about Frank Kincaid; his wife, Cassandra along with his 24-year-old son, Morgan and his 21-year-old daughter Cheyenne who arrived in Marble, Colorado in 1894. To Frank, settling near the mining town of Marble made perfect sense. Marble was near the towns of Carbondale and Redstone and a bit further away was Denver. The area was booming with both settlers and businesses. One thing ranchers and townsfolk’s had in common, was they needed a horse to get from ranches to towns, and to the mines. Three years later, Frank had no idea that on that spring morning; horse thieves would attack his ranch to steal his quarter horses, killing everyone but his daughter. As a handsome cowboy made his way down the mountain above the Kincaid Ranch, he saw the rustler’s attack their ranch, and he raced down the mountain to save the family. Carl Jackson was able to kill the rustler’s; but only Cheyenne was found alive, near death. She was bleeding very badly, and he had no time to lose if he was to save her life. 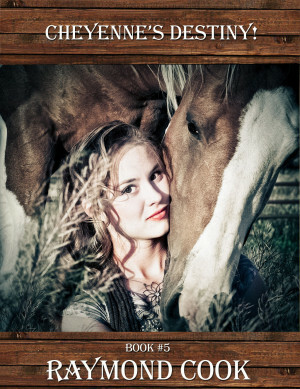 Little did they realize love would grow between them out of his compassion for her, and his love for horses. Cheyenne’s Destiny is an action-packed western frontier eBook. This eBook was uploaded onto Amazon on January 30, 2013. I’ve made this comment section so I can share with visitors to my website what readers feel about this particular eBook. To share your comments too, just go back up to the top of the page and click on the Contact Me tab. I grew up watching all the usual western TV shows when I was young and as I read this authors book, it was as if I were watching the story unfold before my eyes. Cheyenne was strong yet also vulnerable. I really enjoyed this book.